Gametime emailed us yesterday that they’re hiring more Fan Happiness Associates. Pay is $15/hr., with benefits. Full-time. Paid virtual training provided. 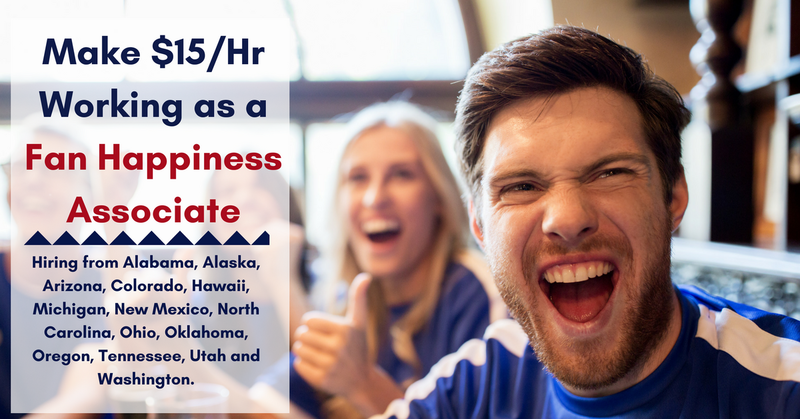 They’re hiring from Alabama, Alaska, Arizona, Colorado, Hawaii, Michigan, New Mexico, North Carolina, Ohio, Oklahoma, Oregon, Tennessee, Utah and Washington. Our Goal: Bringing people together by building the best last-minute, mobile ticketing experience for live events. Gametime is deeply passionate about building a better mobile world for fans to get faster and easier access to live entertainment. Gametime believes that fast and easy access combined with going above and beyond for the fan creates a better world in live entertainment. The Role: Requires unparalleled attention to detail, fast responses, and an upbeat can-do attitude. We’re open 365 days a year. We are looking to hire people with previous work experience in a support role, preferably with a local sports team or mobile tech company. We really care about an ability to speak to sports and music fans confidently with over the top helpfulness. There is one full week of training that will run Monday through Friday 9:00 am until 5:00 pm PST. You cannot miss any time during the first eight weeks. Click here, then scroll down for details and to apply. For more jobs like these, check our Newest Jobs & Gigs page. To be the first to hear about jobs like these, like our Facebook page. Good luck in your next steps toward working from home! This entry was posted in Customer Service Jobs, Hiring Companies, Work at Home Jobs and tagged Gametime. Bookmark the permalink.